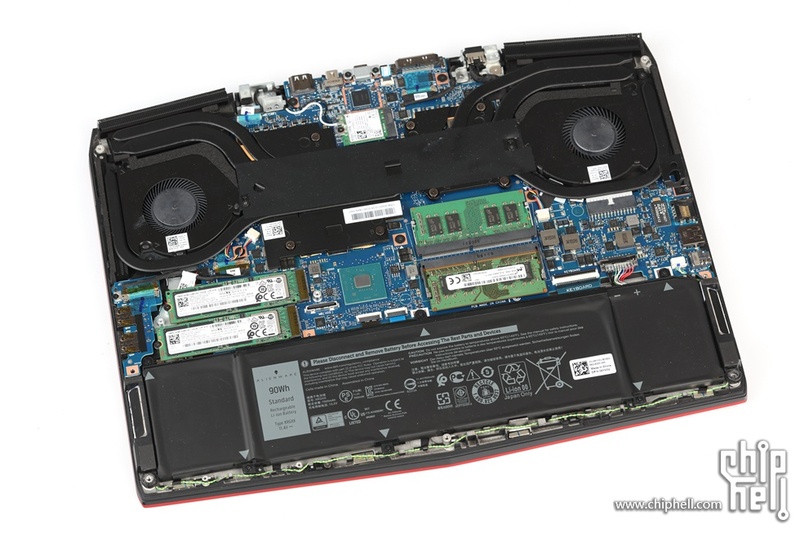 Alienware m15 is the first lightweight notebook in the Alienware family. 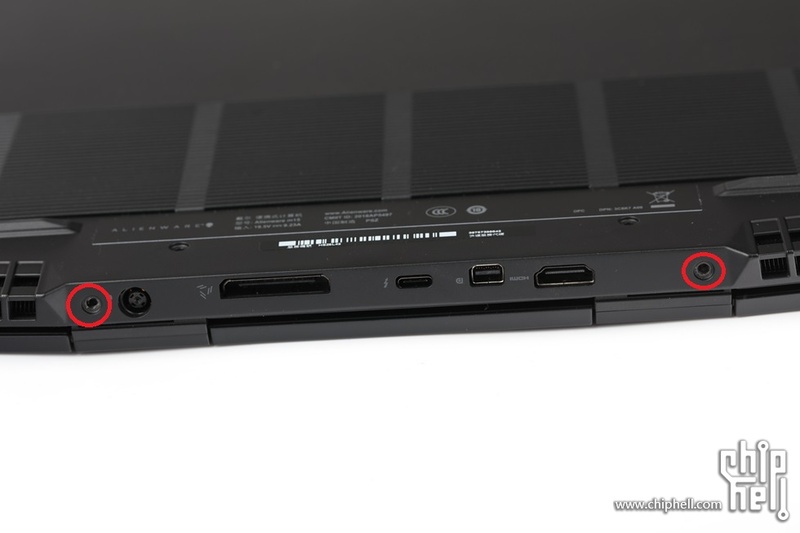 It weighs only 2.16kg and is thinner than the previous Alienware 13. 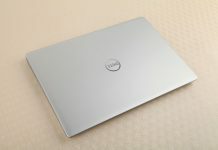 It is also the first narrow-frame notebook in the Alienware family. 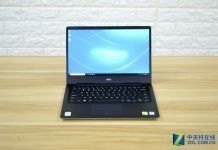 It is equipped with a full HD IPS display with a 15.6-inch 144Hz refresh rate of 100% sRGB color gamut. 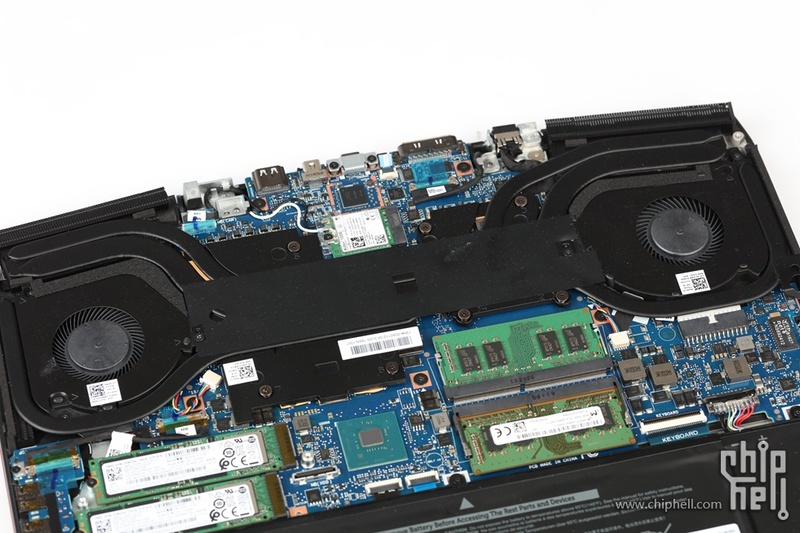 As a gaming laptop, the Alienware m15 keeps the option of dual SSD while keeping the light and thin. The Alienware m15 is powered by Intel’s eighth-generation 7-8750H processor, and the graphics card offers up to NVIDIA GTX 1070Max-Q 8GB GDDR5, It has a 60Wh or 90Wh lithium-ion battery, the 90Wh battery life up to 17 hours! 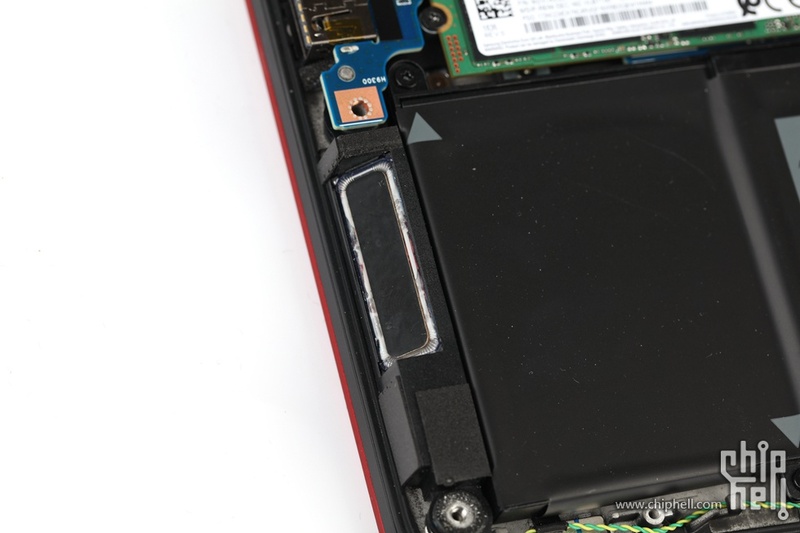 To access its internal components, we need to remove its bottom panel. Its panel is fixed by 11 screws. 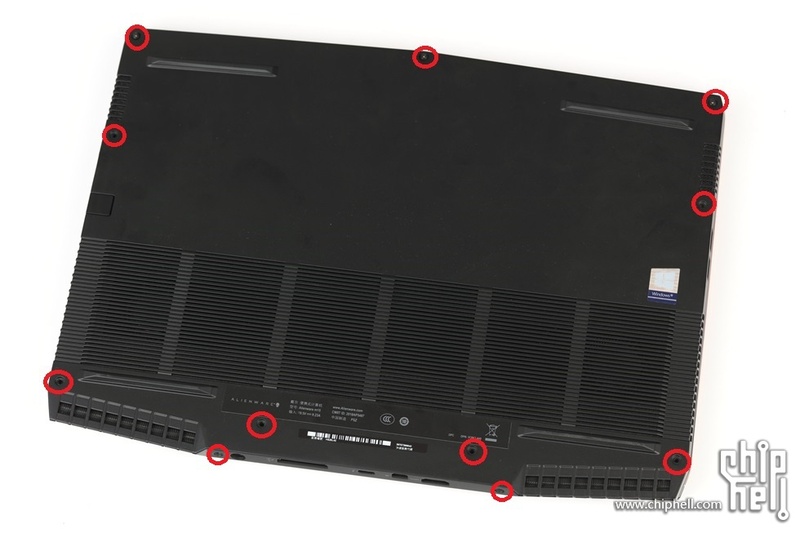 It is worth noting that there are two screws on both sides of the notebook ports. This design seems to be uncommon. After removing the screws, you need to insert a plastic tool or an old credit card under the bottom plate, then carefully slide the tool to separate the bottom plate from the laptop. After removing the bottom plate, we can see all of its internal components, including the battery, SSD, RAM, speakers, heatsink, fan, and motherboard. 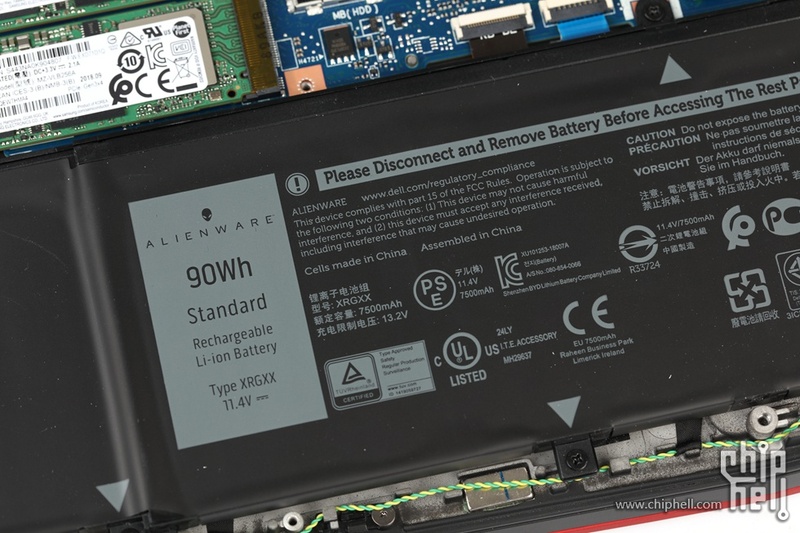 The Alienware m15 comes with an 11.4V, 90Wh Li-ion battery with a part number of XGRXX, which provides over 15 hours of battery life. 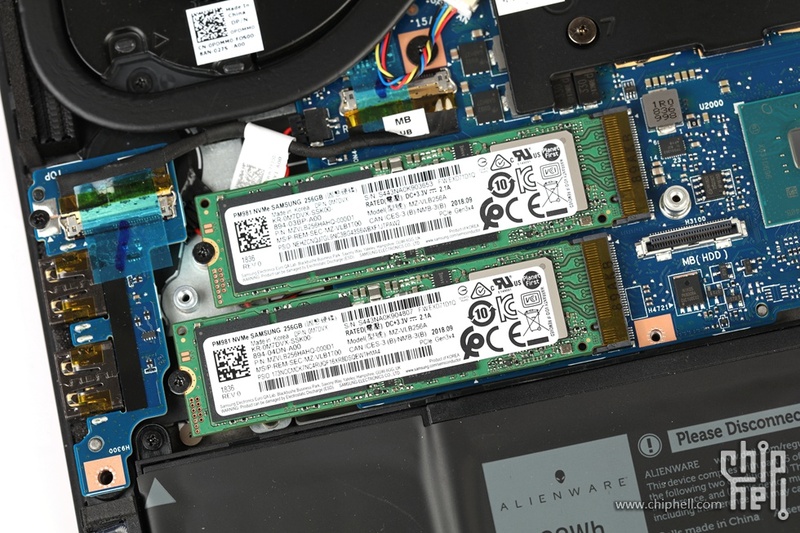 This notebook comes with two Samsung PM981 256GB M.2 PCIe NVMe SSDs. 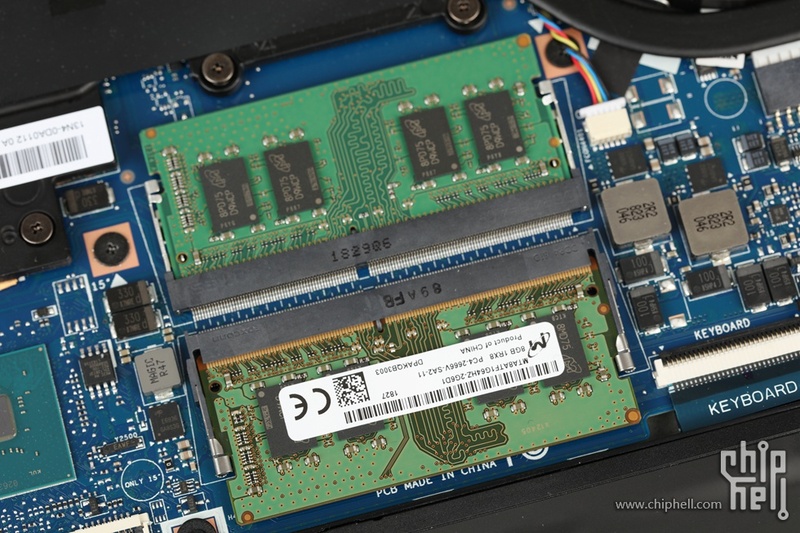 If you need a larger hard drive to store data and files, you can replace the existing M.2 SSD with two large SSD. Its speaker size is not very large. It is located on both sides of the battery. It has only two memory slots. 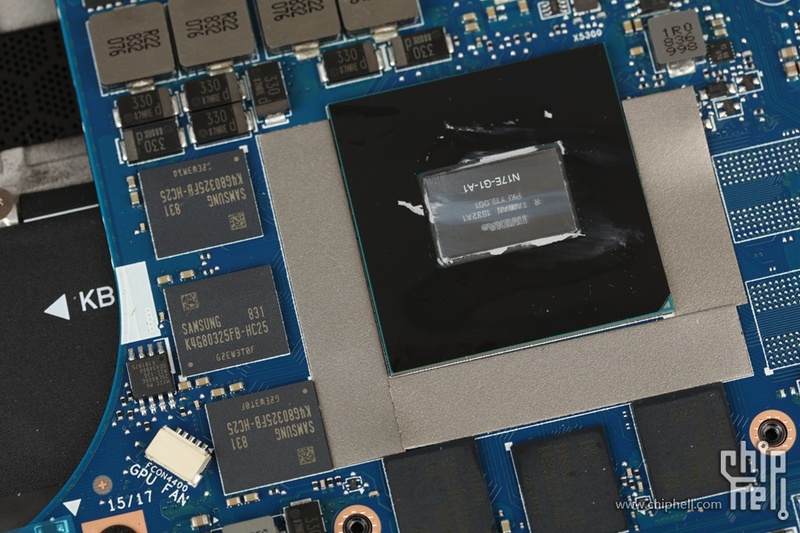 In my case, it has two Micron 8GB DDR4 2666MHz memory, and you can replace it with two 16GB memory if necessary. 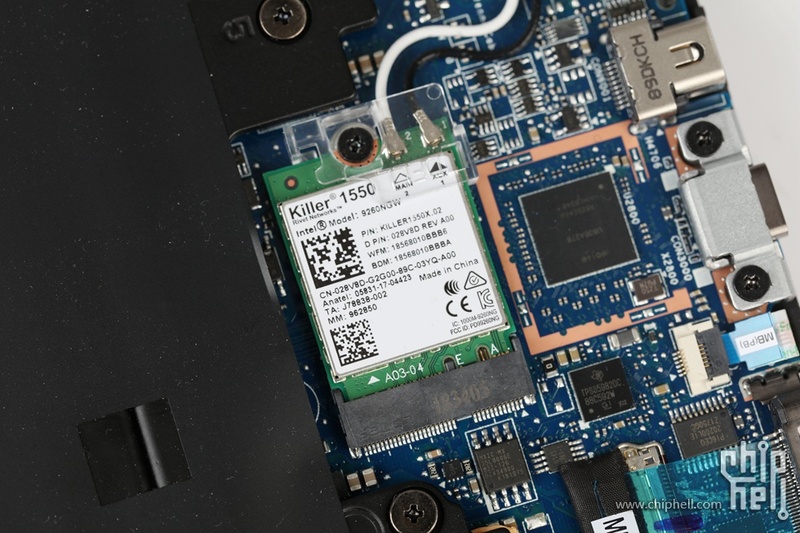 It comes with a Killer 1550 wireless network card with a part number of 028V8D, it supports advanced 802.11ac Wave 2 features including 160 MHz channel support and can drive twice the throughput of what standard 2×2 11ac adapters can deliver. 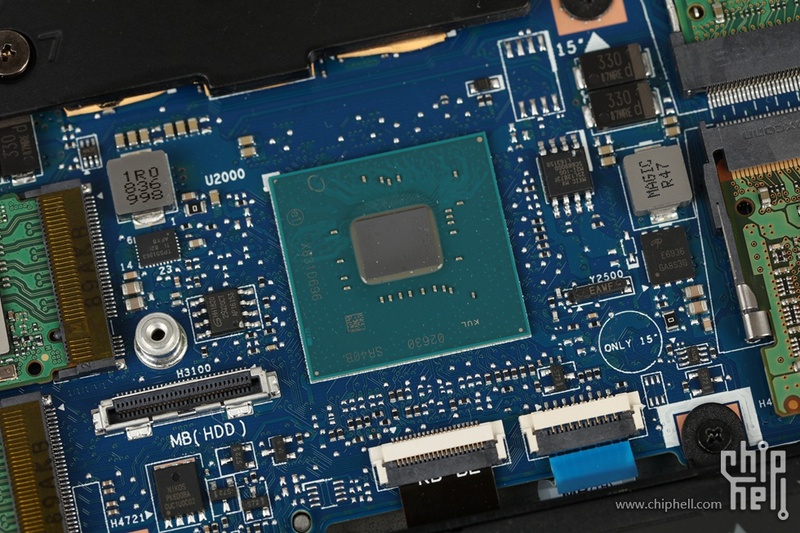 Loosen all the screws that fix the heat sink and the fan, disconnect the two fan cables from the motherboard. 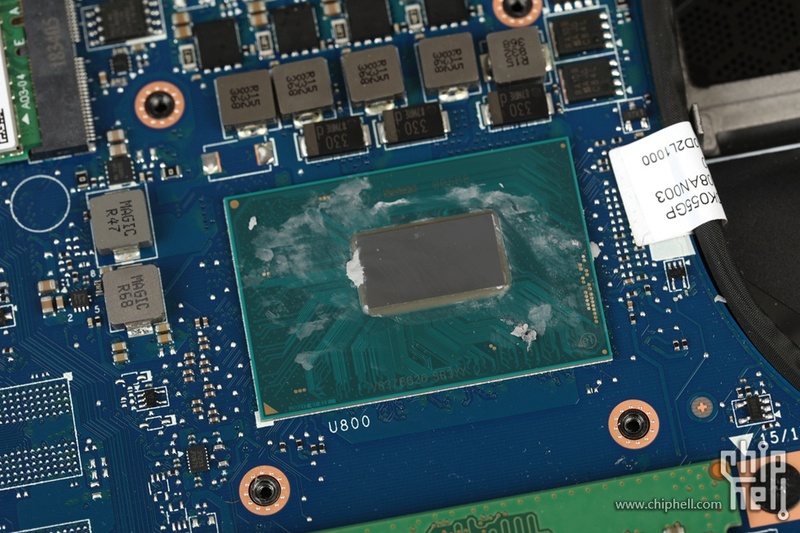 You can remove the cooling system module. 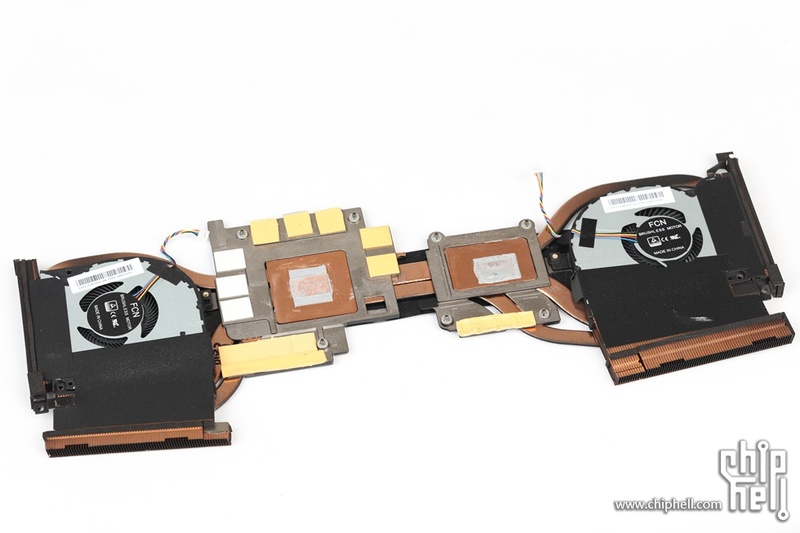 The CPU and the GPU share two heat pipes and a third heat pipe with two fans. The other two images are NVIDIA GeForce GTX 1060 graphics card and Intel i7-8750H processor. Does anybody know where to get the SSD caddy for the M15? I cannot find the part number anywhere.